I drive a little slower whenever I pass the clapboard white church on the hill, sign board out front. As usual, I can’t resist checking what message is posted on the marquis for passersby to see. “Burdens leaving you wrinkled? Come inside for a faith lift.” Okay, it’s a silly pun, but I can’t help but smile. These signs always grab my attention. Sometimes I indulge in wondering whose job it is to pick the slogan for the week. Do they sit with a cup of coffee musing on what inspiration or witty phrase to use? 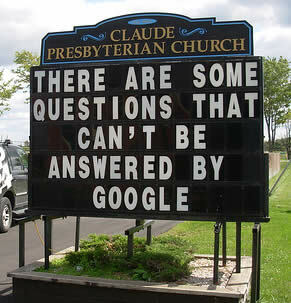 Is there some database full of potential church signs? Their motivation may be to attract new members or maybe just to make people think about faith. Either way, they’ve made my drives a bit more pleasant and even more reflective. Of course, I’m not suggesting that I want people to be Pharisaical – boasting of their religious practices out of pride. Rather, I desire that sense of unity in faith that comes through encountering other believers. Occasionally, I’ll see a family say grace together before a meal in a restaurant. I’ve run into a husband and wife saying the rosary walking along the beach. A few weeks ago, my husband and I saw a couple in their early twenties kneeling in front of an outdoor statue of Mary. We paused for a moment, remembering our own reliance on the Blessed Mother. Too often, these genuine gestures of faith in public life are suppressed. Some of us, perhaps, do not wish to draw attention to ourselves; others may simply forget. But when we talk about the New Evangelization, it can’t just be a topic in a homily or a catch phrase for parish initiatives. We evangelize through our witness to the joy of being Christian. If I’m thankful for my food, shouldn’t I thank the Lord regardless of whether I eat at home or in a restaurant? If someone asks me what I did this weekend, should I neglect to mention that I went to Mass with my family? This entry was posted in Caitlin Bootsma and tagged church signs, evangelization. Bookmark the permalink. Interestingly, when one is away from family and in the midst of the secular world (e.g., at lunch near the work site), people tend to forget God. If we are praying ceaselessly as St. Paul encourages, then we will find it to be more natural to give thanks to God at lunch in public places because we are perpetually, at least subconsciously, remembering God, and He is present to us, and we thank Him because we acknowledge His presence in our hearts. To do so, we need to frequent the Sacraments, especially Reconciliation, and pray daily. But we all need to understand the pressure we feel was prophesied by Jesus Christ – that we are like that grain of wheat which takes root in a field of thorns and, in that state, are weakened by loss or lack of Light. So we need to get more Light more often! We need the Grace of Jesus Christ! We are indeed in a field of thorns, but the Lord will help us, and we need to persevere in growing closer and staying close to the Lord and following His Way.